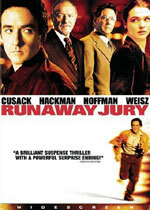 Synopsis: Every jury has a leader, and the verdict belongs to him. In Biloxi, Mississippi, a landmark tobacco trial with hundreds of millions of dollars at stake begins routinely, then swerves mysteriously off course. The jury is behaving strangely, and at least one juror is convinced he's being watched. Soon they have to be sequestered. 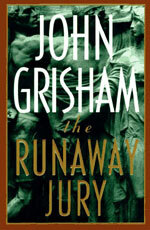 Then a tip from an anonymous young woman suggests she is able to predict the jurors' increasingly odd behavior. Is the jury somehow being manipulated, or even controlled? If so, by whom? And, more important, why?